Hello, and welcome to another recipe of mine. You’ve come to the right place if you want veganuary made family-friendly! It’s my heart-warming, feel-good speltotto which makes veganuary also tasty and super easy! Are you trying hard to eat vegan this January but you are finding yourself cooking different meals for everyone in your family? Don’t despair as there are lots of recipes on hand to make your life a little easier. To me it’s never been a problem finding new recipes, the world wide web is full of them. It has been difficult however to find new recipes that my whole family will eat. So all my passion over the last four years has gone into making healthy eating family-friendly, tasty and easy! I hope you enjoy my speltotto as much as we all do! You could swap out the veggies for any others you have in the fridge. And if you are not too bothered about making your dish 100% vegan, then add bits of feta or goats cheese. This speltotto recipe is super versatile and full of great flavours and nutrients to keep you going strong this winter! If you want to find out more about veganuary, then head over to their website. It’s vision: Veganuary’s vision is a world where veganism is a mainstream lifestyle choice, with a positive action at all levels of society and government to promote the benefits of plant-based eating. Heat the oil in a large frying pan over a medium heat. Add the onion and cook for 5 minutes until soft and translucent, then add chopped carrots and cook for another 5 minutes. 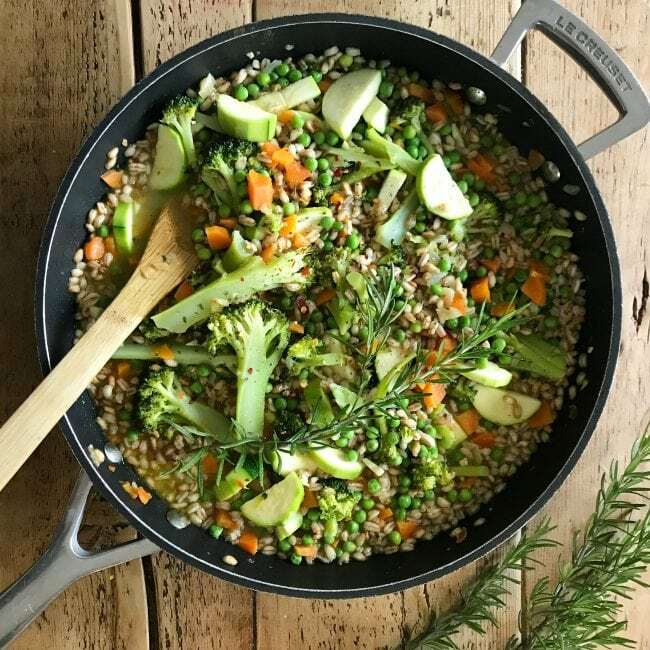 Add garlic and mix in pearled spelt and gently combine all ingredients, stirring constantly so the spelt is coated in the hot oil and does not stick to the pan. Reduce heat to a low simmer and begin to add some stock. Pour over big glugs of stock, stir, let the liquid absorb and carry on doing so for about 15 minutes, until the spelt starts to become tender and all the stock has been absorbed. Season with salt and pepper. Sprinkle over lemon juice. Start with 1/2 a lemon first but add more if you like it tangy. In the meantime blanch your broccoli: Bring a pan of water to boil, put in your broccoli florets and boil for 2 minutes. Drain and rinse with cold water. Serve with simple crunchy lettuce dressed in a little lemon juice. This makes a lovely lunch for the next day. Making leftovers on purpose feels super rewarding. You can turn off the heat as soon as the veggies have cooked for a couple of minutes, put a lid on your pan and just let your speltotto rest. The flavours will soak up nicely, the veggies carry on cooking in the hot spelt. There’s very little washing up with this one-pan dish and it makes life easier when family members eat at different times.